Engine removal fail! How NOT to remove your engine! Engine removal fail! How NOT to remove your engine! When you’re doing something in life, and you need some help with that, don’t turn to forums. I mean, sure, you can find all the info on the internet, but not forums. If you follow someone else’s advice, make sure they’re trustworthy and a renowned publisher/uploader. Whoever was suggesting that this was a good idea, they failed hilariously. The uploader of the video needed to get a blown motor out of his car, so he setup the camera and demonstrated exactly what can go wrong with this method. Honestly, I think that he could’ve knocked the car over in the process. Let this be a lesson to all, use an engine crane. At least in cars where it’s not designed to come out the bottom. 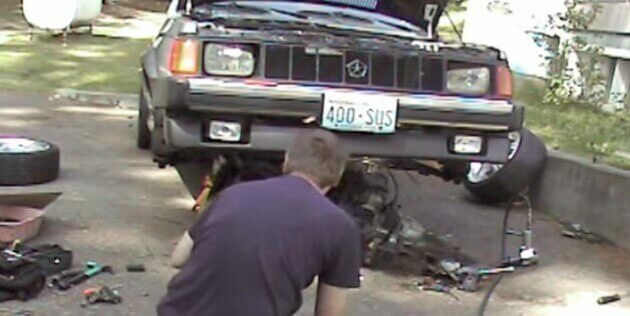 Check out this engine removal fail! The Ultimate BMW R1200R Cafe-Scrambler By Lazareth! Broken reverse? Nothing to worry about. Just ask this guy!